There is a funky bar in North Hollywood called the Idle Hour. I’ve been driving by the barrel-shaped building for years and, like so many other Valley residents, was excited to learn that the 1933 Group had scooped up the unique structure and was pouring new life into it. It’s a great local place to hangout and the interior is stunning, but this post is about one of the drinks on the menu: the Mr. President cocktail. This drink happens to be a favorite of a few friends and they asked if I could recreate it so that they could make it at home. I have to apologize for the delay in posting this recipe – especially as my friends requested it weeks ago! – but better late than never. 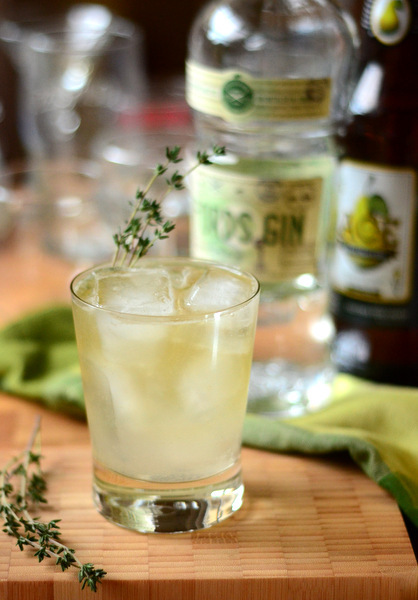 The cocktail is crisp and refreshing thanks to the classic combination of dry gin and lemon juice. The Idle Hour used Ford’s Gin in the original recipe and you can’t go wrong with it, though other dry gins will also work nicely. 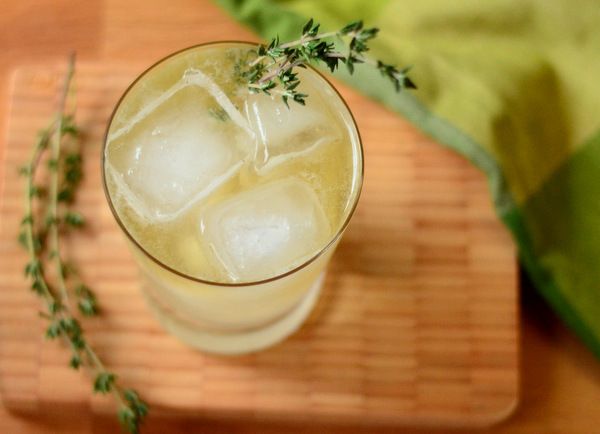 The thyme-infused syrup gives the cocktail a subtle herbacious note and blends well with the lemon. While I don’t always like cocktails that are finished with beer or cider, the pear cider used here adds just the right touch of fruitiness to the drink and makes it just as good an option in the winter (when pears are in season) as in the summer. If you like your drinks a little sweeter, feel free to increase the simple syrup by another 1/4 oz. Combine gin, lemon juice and simple syrup in a mixing glass, fill with ice and shake vigorously until well-chilled. Strain into a rocks glass filled with cubed ice and top of with pear hard cider. Garnish with a sprig of thyme. Rub the thyme gently between the palms of your hands to start to release some of the oils from the leaves, then combine all ingredients in a saucepan. Cook over medium-high heat until the sugar has dissolved, then remove from heat and let stand for at least 30 minutes. Strain out the thyme before using. Store in the refrigerator.